Did Google go too far ... or is Google victim of legal lag? Yours truly had the honour to write a chapter for a very promising book called Google and the Law edited by Dr. Aurelio Lopez-Tarruella, of which I have so far only read my own chapter. But the colleagues I know are all very knowledgeable in their respective fields and we all share a passion for the law. Hope I will see them soon and meet the colleagues I have not met before. My chapter 'Paradoxes, Google and China' is about the blessings of intellectual property and the evil of censorship, two subjects about which both Google and China had some issues. I forgot to place a disclaimer at the end of my chapter, which should have said: I used Google when researching the chapter and enjoyed the hospitality in Shenzhen at the same time. Google has proved to be one of the most successful business models in today’s knowledge economy. Its services and applications have become part of our day-to-day life. However, Google has repeatedly been accused of acting outside the law in the development of services such as Adwords, Google books or YouTube. One of the main purposes of this book is to assess whether those accusations are well-founded. 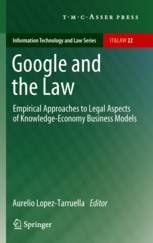 But more important than that, this book provides a deeper reflection: are current legal systems adapted to business models such as that of Google or are they conceived for an industrial economy? Do the various lawsuits involving Google show an evolution of the existing legal framework that might favour the flourishing of other knowledge-economy businesses? Or do they simply reflect that Google has gone too far? What lessons can other knowledge-based businesses learn from all the disputes in which Google has been or is involved? This book is valuable reading for legal practitioners and academics in the field of information technologies and intellectual property law, economists interested in knowledge-economy business models and sociologists interested in internet and social networks.